Since 2004 we have helped train thousands of landlords how to use QuickBooks. It is an honor when we read their testimonials. (Check them out, read how customers love us). We couldn’t imagine trying to have customers if we couldn’t trust them. That’s also why there are no DRM or copy/printing restrictions on the pdf ebook. We have suggested past customers go to Kinkos or Office Depot and print/bind the full manual. This is usually extremely affordable, and you get a physical hard copy to take notes on and add bookmarks to the pages. If the copy center gives you any problems about a copyright and they won’t print it – please ask us and we’ll explain how we give you permission to print what you need. After you gain access to the members only area, you can download your files over and over, again and again. You’ll still have access years later. And, as we improve the content we’ll let you upgrade your training to the latest that we offer. As for answering questions over email and in the forums, we currently do not have a cut off date. We have customers from 2006 who occasionally send us emails, which we gladly answer. We can’t answer everything, as sometimes you really need to discuss complicated issues with you tax advisor, but we are glad to help wherever we can. The full product is for sale here, however I have a special “pay only what it is worth to you” guarantee. If within 30 days you’re not totally satisfied, you can get your money back, 100% of it. Or you can request a partial refund, based on what it was worth you. Yes, you can get a bargain with this offer, but we want to ensure you have no reasons to hesitate from investing in our training. It is really good, and we stand behind it 100%. We recently recommended entering Properties as Customers and Tenants as Jobs. What if you have an existing company file where your tenants were customers? Read on to learn how to convert those customers (tenants) into jobs without losing historical transaction information. The secret is in dragging and dropping the tenant (currently as a customer) under a new customer (which you have to create, which is the job). Open the Customer center. Here we have a customer “My Existing Tenant” that we want to make a job. We also created a new customer that will represent the property. In the end we want the old tenant to become a job under the new customer (property). Look for the diamond next to each row in the list. Click the diamond and drag it to the right. That’s it. You can double click and edit the name of the job if you wish. Now you moved the existing customer into a job under the new property (customer). This is helpful if you bought our training and are migrating an old company file into using our best practices. Hopefully this helped. Read more from Landlord Accounting’s blog, or order the full guide now. Tenants as Customers or Jobs in QuickBooks? How do you enter tenants in QB’s? In our training, we recommend you set your tenants up as Jobs in QuickBooks. Properties are Customers. If you have several tenants that pay separately, you can create multiple Jobs under one property (Customer), and then memorize independent invoices for each of them and ‘receive payments’ for each. This gives you a significant organizational simplification within your QuickBooks company. Doing it this way makes for automatic, at-a-glance, rent-rolls. You can see vacant properties, overdue tenants, and everything in a “rent roll” at a glance. No report needed. It reminds you of a tenant’s location (which is hard when you have dozens of tenants, and you find yourself thinking of things in term of units/buildings rather than tenant names). You also can search by name or property within the list, as shown below. In the example below (from our training company file with 12 months of sample real estate transactions) you can see three tenants that share a unit. None of the tenants owe any money, if they did the current amount due would appear in the Balance Total column. 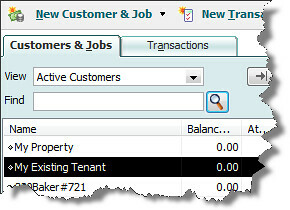 Read the related article: How to convert a Tenant as a Customer into a Job in QuickBooks. Find this helpful? Want to learn more about QuickBooks and landlording? Read LandlordAccounting’s blog Or, order our training today and become an expert tonight. Calculating Cap Rate (Capitalization Rate) for real estate investments is straightforward. We previously explained cap rate for real estate investors and landlords. Recall that Cap Rate = Net Operating Income / Value. Here’s how you calculate the Capitalization Rate for one of your rental properties in QuickBooks. This uses the Sample Data File included in our training course. Step 1. Find the value of your property. Check the Chart of Accounts for the property’s value. Since we keep depreciation in a separate contra-account, you can grab the value that you see without adjustment. Here we will compute the cap rate for a duplex, 3304 Covenant. Step 2. 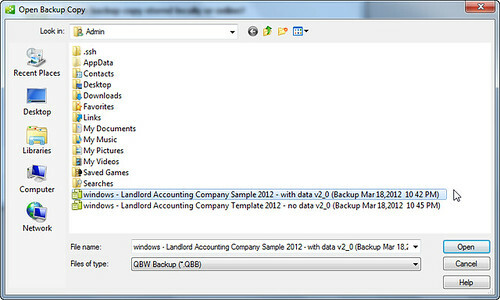 Go to the Reports menu and choose the LandlordAccounting.com memorized reports menu. Choose profit and loss by class and filter to only show the 3304 class and sub-classes. The Net Adjusted Income for this property is $8,362.57. Step 3. Calculate the Cap Rate. In our example that is $8,362.57 / $90,000 = 9.3%. Questions? Contact us, or leave a comment below. Want to quick start your real estate investing? Purchase our full training today, with a money back guarantee. Return to the blog for more articles on QuickBooks landlord accounting and real estate investing. Previously, we explained for Windows and Mac users how to import the training files you purchased. Now, we break it down for users of the Online versions of QuickBooks. Step 1. Email us requesting the online edition data files. They are not currently in the members only area because most customers still use the desktop versions of QuickBooks. Due to QuickBooks Online limitations, you must use Windows and Internet Explorer for importing. Read more about how to work around this if you only have a Mac. Step 2. Log into QuickBooks Online. It is important to note that having multiple online company files requires multiple subscriptions. With only one subscription, you can create and delete many company files, trying new things each time. But, you may only have one active company at a time, and delete any existing company file so you can import the sample company. Log into your old company and click the dropdown in the top right. Go to My Apps. Go to the Manage My Apps tab and click Cancel subscription. Confirm you want to do this. Then go to http://quickbooksonline.intuit.com/ to sign up for a new account, at whichever cost level you want. (Try the free trial to learn if it will work for you.) For more help deleting and creating a new company, read this. (If you are paying, you won’t have to pay any more because this new account will replace your previous account). Step 3. Logged into a brand new QuickBooks online company file, choose to Import QuickBooks Desktop Data. Upload the the special online edition file that we gave you. When prompted, if you want to view sample transactions, choose to import everything, if you want a template just import the lists. You may need to wait a short while once you imported the file before it is available to use. Check for an email from QuickBooks when your file is ready. When it is imported (it only took a few minutes for us), explore all of the data and transactions you now have. When it is time for you to create a real company file, you can erase all this data, or go through the import process again. Questions about landlording and QuickBooks? Contact us, we’re glad to chat. Want to start learning today with our custom landlording training? You can buy our full training with hundreds of pictures explaining everything. Example: You purchase a $200K rental property for 30% down plus $4K in closing costs. You invest $10K cash in improvements. After expenses, your first year’s pre-tax cash flow is $12K. The Cash on Cash Return would be $12,000 / $74,000 = 16%. Cash on Cash return is one of the simplest and most versatile ways to evaluate real estate properties. You can quickly determine if an investment is performing favorably, as well as trying to detect if a property for sale is underpriced. (See also our cap rate blog post). Sum the annual income including rent, fees, laundry, parking, everything. Leave an allowance for vacancies. Subtract expected cash outlays, such as expenses (repairs, interest expense) and the mortgage payment. If cash is extracted from a property, through a refinancing for instance, don’t include that cash in the annual cash flow, because that return of capital is not income and it would misleadingly inflate your rate of return. Cash on cash return is based on before-tax cash flow, so it does not consider the investor’s tax circumstances (although it could become more favorable after the tax saving depreciation expense is considered). Cash on cash return also ignores property value appreciation. It ignores what investments your cash flow could be reinvested in, thus neglecting the effects of compound interest. If you are doing a forward looking calculation, you will not have income information about that transaction in QuickBooks, so you can do it all on paper or in Excel. (Perhaps basing your vacancies and expenses on actual comparable numbers, though.) If you have entered the purchase price already, you can calculate this with a few clicks and a simple calculator. To learn more (quickly), invest in our QuickBooks training for landlords and property managers today. Everything is 100% guaranteed and you can read other investors testimonials ♥ for more information. If you enjoyed this, also read about the Cap Rate explained for Landlords and Real Estate Investors or the rest of our landlording blog. Short version: Cap Rate = Net Operating Income divided by Total Value of the Property. In other words, for every $100 you invest in that property, you expect to earn $11.70 per year. Cap rate can be used as a way to quickly compare returns on investment between different properties. It is as if you have a cash only purchase, thus if you use financing the cap rate will not be the actual leveraged return you will get. Determine gross revenue by adding all the rental, laundry room, and other income. Subtract income lost from vacancies. This is effective gross income. Subtract operating expenses (maintenance, management, advertising, etc). That is your Net Operating Income. Key to remember for the NOI is all revenues must come from ongoing operations and not a one time asset sale or insurance payout. Also, do not consider depreciation and debt service for expenses. These conventions are used because we are focusing on the asset’s value, and one time events, depreciation, and financing reflect irregular events, tax issues, and capital structure, not value. Because Cap Rate = NOI / Value, if you have a target Cap Rate you can estimate your max price by dividing NOI by cap rate. Example: 8% target cap rate / $200K = $2.5M. Compare that to what the actual properties are selling for (and verify your assumptions for NOI). Cap Rate does not consider financing. In thoroughly evaluating an investment, you need to consider what your actual return on investment will be, after financing. Also, verify all assumptions of the costs and occupancy rates if you are given a cap rate for a property from another investor or seller. Consider other factors such as the stability of expected income, property value appreciation, and your alternative investments you could buy instead. If you invest on fundamentals in the stock market, the Cap Rate can be considered the real estate version of the P/E ratio. The P/E ratio is the market value per share (price) of a security divided by the earnings per share. This is the inverse relationship of what the Cap Ratio is for real estate investments. A P/E of 20.5 could come from $40 share value and $1.95 earnings per share. This is the “price multiple” or “earnings multiple.” The cap ratio can be considered similar because it is the opposite comparison: the net operating income divided by the value. Much like it is useful to compare P/E ratios of one company to another in the same industry, it is useful to compare similar properties’ Cap Rates. We hope you enjoyed this article. Read more about real estate accounting and QuickBooks at LandlordAccounting.com. Invest in our training too, for more help with QuickBooks and landlording. Previously, we explained for Windows users how to import the training files you purchased. 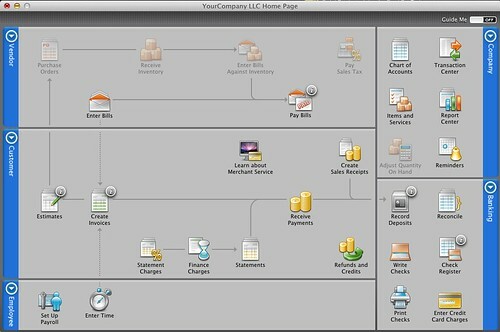 Now, we break it down for landlords using the Mac version of QuickBooks. Use the online edition? Read those instructions. Step 1. Download the data files from the members only area. Step 2. Open QuickBooks for Mac. 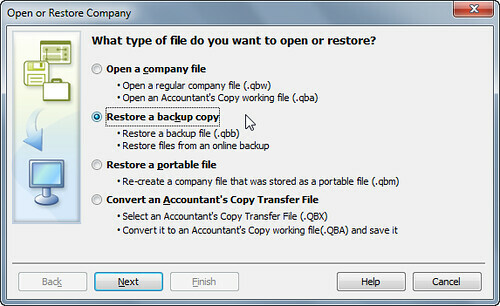 Choose to restore a backup file. Step 3. Choose where to restore the file. You can browse to a different location so that it saves the file in a nicely organized place for you. Step 4. Confirm that you are going to restore a backup file. It will confirm that you restored the file, and offer to show it in Finder. Great, you’re done. Now the Company file opens up, and you can begin exploring in QuickBooks. 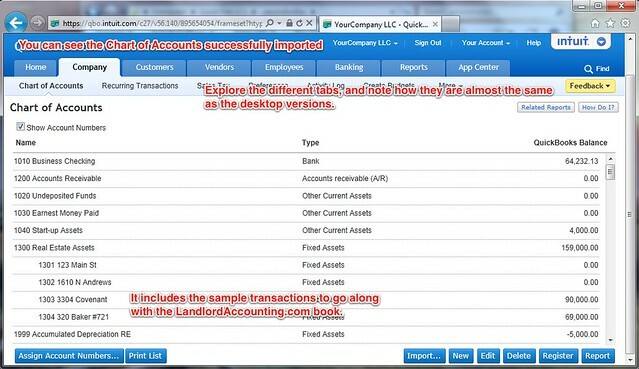 We hope you find this helpful for managing your rentals in QuickBooks. If you want to understand more, feel free to contact us. Impatient? You can buy our full training with hundreds of pictures explaining everything. Great, you just invested in learning to use QuickBooks for landlords. 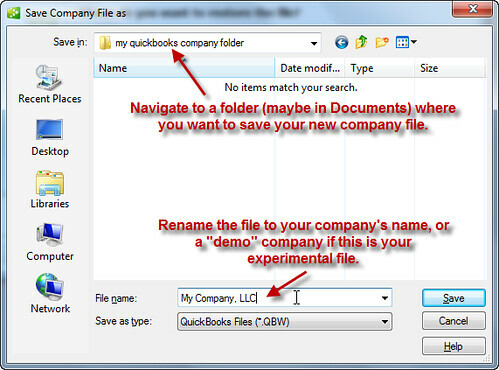 The following instructions show exactly how to import the company file for QuickBooks 2012 on Windows. The instructions are essentially the same for all other year’s versions on Windows. Mac user? Read the Mac instructions for landlords. Online user? Read those instructions. Step 2. Download the files in our members only section with the login you received upon purchase. Take note where you save these files. Step 3. Restore these backups. Click the button or use the File menu to open the file. Step 4. 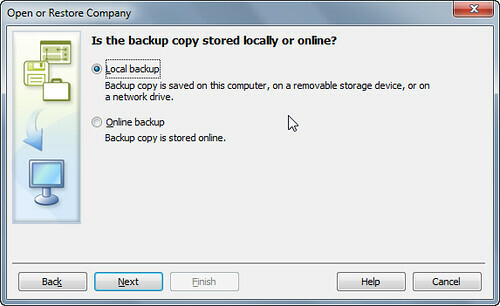 Choose to restore a backup copy. Step 7. You’ll see this screen, click Next. Step 8. 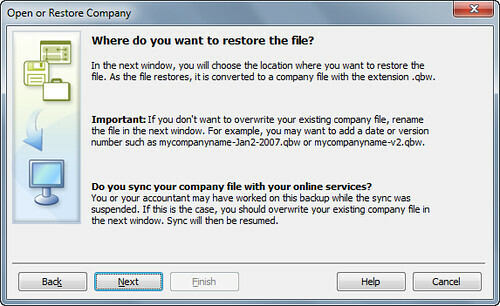 Now, choose where to restore thihs company file. If restoring the “template file” this could be the demo file we suggest everyone creates, or your actual file. If restoring the “sample company” file, generally it is best to leave the name as the default, so not to confuse it with your company files. That’s it. 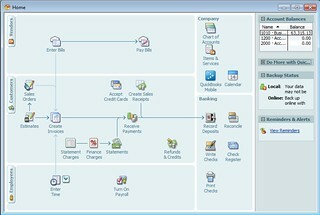 You should then be able to have everything imported into QuickBooks. Now you can repeat this for the template file. 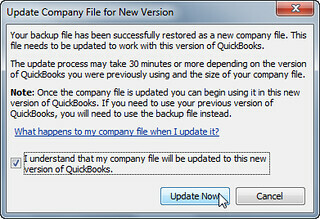 Note, it is possible you see a message about upgrading the company file, if you are restoring a backup from a previous year’s version of QuickBooks. This is the screen you will see, but don’t worry about it. Go through the prompts presented, and Update Now. After working with thousands of landlords to teach them how to use QuickBooks for rental property management, we have a few suggestions for how to quickly get up to speed. These assume you have a copy of our training book along with QuickBooks. If you don’t want to purchase our training, signup for our free newsletter (at the bottom of this page). Mastering your bookkeeping quickly is more enjoyable that doing it slowly, so hopefully you invest in our 100% guaranteed education. Since you’re new, here’s what we suggest: pick up our training program, skim (don’t read) through the book. Then open up the data file. Start in the reporting chapter and run some reports. Spend time “doing” even if you don’t totally understand it all. Take a step back, and watch the QB’s videos that come from Intuit. Having first seen the landlording specific company file will help all the videos “stick” better. From there, explore more in the company file, using the ebook as a guide. Create a “demo” company by copying the Template File you downloaded from us (or use the EasyStep interview if you have more time). Don’t expect it to become the real company file; it is just something you can play around with. Try entering last month’s transactions. Play with it a few hours over several days (so it will sink in) and then go for the real thing. Create a real company file for your company. Using our template company: copy that file you downloaded and rename it to your company’s name before you start. Start entering transactions. Make frequent backups, and don’t be afraid to ask for help in the forums. Also, here’s a perfect time to show your hard work to your accountant and get any suggestions or corrections up front, rather than waiting until tax time. Included in QuickBooks are a series of introduction videos. These are a fairly quick way to understand the terminology that QB’s uses. Watch these and then open our sample company file. Skim the book for the example transactions of recording rent due, receiving rent payments, late fees/finance charges, making repairs, and buying/selling rental properties. Cross reference the transactions with the company file. Then create a fake “demo” company for you to play with. You’ll always keep this even when you have your own company file. It is a useful tool to test out transactions where you don’t have to worry about messing with real data. Lastly, start by trying to enter one of your properties recent investment property purchases, rehabs, and leasings. Transition that into your real company file. 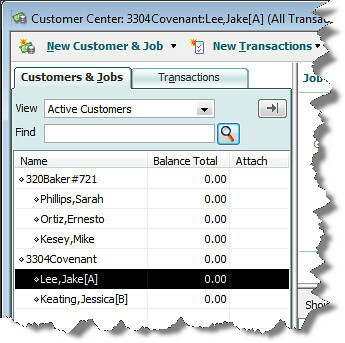 Start with the sample company file, creating reports to see how transactions were entered. Ask questions on the free landlording forum, or email us. Please feel free to share your tips. Key for landlords is getting the correct chart of accounts, and knowing how to enter tenants, properties, repairs, capital improvements, rent due, and rent payments. You can master that in an hour with our training, and then start directly with your company file. Refer to the ebook for examples as you need them. Show your work with your accountant as you think you are getting set up. Feel free to show the training book with them. Get their feedback and approval, and we’d love it if you leave us sa comment too sharing your experience.